Listing: Victorian Gothic territorial army building in two sections. Principal block is of three storeys beneath a pitched roof: first floor single large hall, very finely decorated internally. Seven bay facade; central bay emphasised with an oriel window at first floor and a squat tower and spire over. Four‑bay subsidiary block to north matches lower two floors of main block. 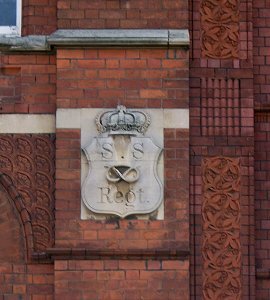 The building was built c 1890 as a headquarters building for the South Staffordshire Yeomanry Regiment of the Territorial Army whose device appears in two stone panels on the facade. 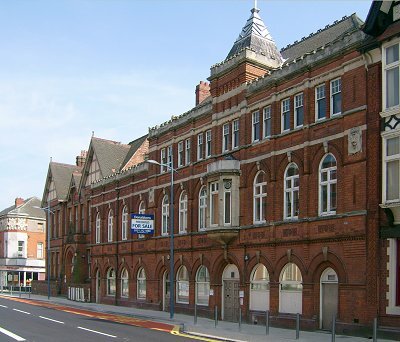 Originally connected to a drill hall on a site in Thornley Street, now redeveloped. Fine Victorian military architecture with an excellent range of interior features extant and notable terracotta details. The first floor mess hall, and the formal stairs and approach to it, are of real quality. A building of architectural, townscape and social history value. Comment: The Yeomanry in 19th century Wolverhampton may not have been of great military importance but it was of considerable social importance. This building was used not only for their military purposes but for the Yeomanry's balls and other social functions, as well as similar events for other organisations. The building's history after the Yeomanry is not known but it is thought that it was used for many years by the borough council. By the 1970s it was in the hands of the Polytechnic who used it for varied teaching purposes. Now, 2007, they are selling it. The whole of this building ought to be kept, the outside unaltered and the inside altered only to a necessary minimum.